"Thanks for all you’ve done, the process has been pretty seamless and I appreciate your professional knowledge and ability to communicate all the details to me. I believe having a website, especially one so well done, is instrumental to the professionalism of my business. Thanks again for the quick response to setting up the website and the ease in working with you. I truly appreciate your flexibility, creative thoughts and professional delivery of a wonderful product." 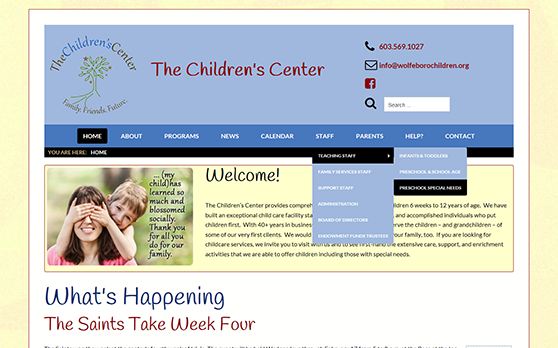 The Children’s Center provides comprehensive childcare services to children 6 weeks to 12 years of age. They have built an exceptional child care facility staffed by caring, highly-qualified, and accomplished individuals who put children first. With 40+ years in business, the Center is proud to serve the children – and grandchildren – of some of their very first clients. They would love the opportunity to serve your family, too. If you are looking for childcare services, we encourage you to visit them to see first-hand the extensive care, support, and enrichment activities that they are able to offer children including those with special needs. 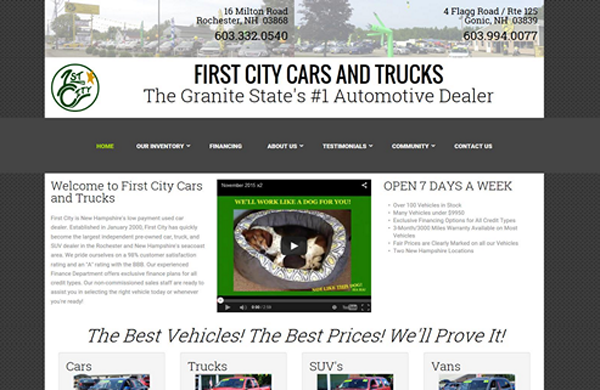 First City Cars and Trucks, New Hampshire's largest independent pre-owned car, truck, and SUV dealer in the Rochester and New Hampshire Seacoast areas, needed a website that put them in control. PCS Web Design delivered a CMS-enabled website that provides them with complete control of their website's content. From full management of their vehicle inventory, including custom-coded features for vehicle VIN-decoding and data export, to customized displays of their complete inventory, PCS Web Design delivered a website that put them on top of Google's first page (in fact 'First City Cars and Trucks' is all over Google's 1st page) by helping them develop an SEO strategy, providing training, and getting them to understand how their new website provides them with complete control over the most important elements of their SEO to outrank their competition. Customers can even book test drives directly from the website! Their website uses a responsive, mobile-friendly design and is connected to the multitude of social media platforms they use including: Facebook, Twitter, LinkedIn, YouTube, Pinterest, and Instagram. They now have an extremely powerful online presence that is adding fuel to this growing and expanding dealership. 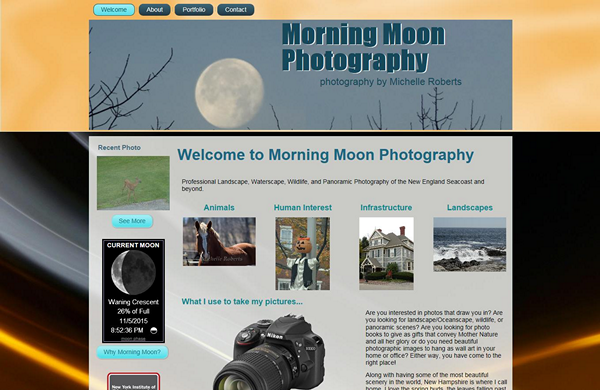 When the photographer and owner of Morning-Moon Photography met with Jim Fontaine, owner and Internet Architect at PCS Web Design, she knew it was meant to be. Sharing a common love and appreciation for nature, wildlife, animals, and photography, it was easy to build a website that accurately and faithfully represented this photographic artist and her growing body of work. PCS Web Design used both a responsive and mobile-friendly website design that makes it simple to browse the photographer's online portfolio from desktops, laptops, tablets, and even smartphones. Now that's picture-perfect in our book. 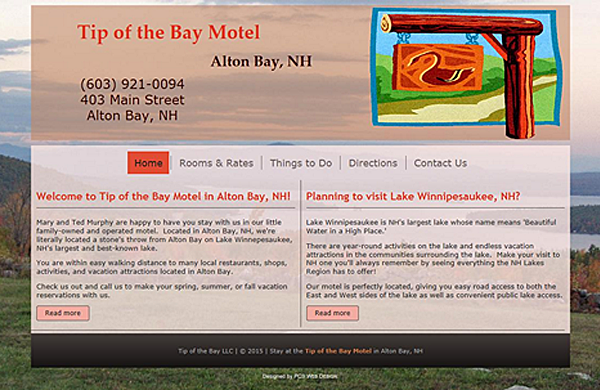 Located right in Alton Bay, NH, this small 6-room motel was practically a best-kept secret - but, not any longer! Since PCS Web Design built this basic business website for owner/operators Mary and Ted Murphy, their little motel has been booked solid. The owners invested in many upgrades to make their motel's rooms comfortable and inviting and then made the smart investment in having PCS Web Design build a website that got their motel found by vacationers and travelers to the area. 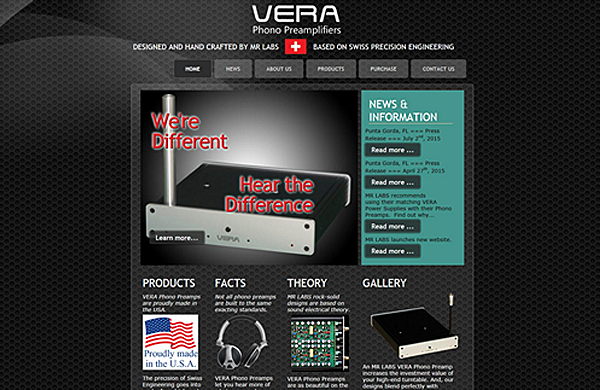 MR-LABS, located in Punta Gorda, Florida, manufactures and distributes its VERA line of phono preamplifiers directly in the US and Canada through its new CMS-enabled website designed by PCS Web Design. Working closely with the company's owner, PCS Web Design was able to organize and present key product information critical to the audiophile marketplace in a logical and easily-accessible manner. With a responsive design that's also mobile-friendly, potential customers can get the information they need from any device, anywhere, anytime. Communication and pre-ordering of this high-end product is facilitated via streamlined forms that provide the business with the information they need. Vinyl lives and MR-LABS can add spice to your record collection's life!